Prehistory: Geologists believe that it is from seismic activity, steadily or rapidly the land was formed. Archaeological studies have identified many Palaeolithic, Mesolithic, Neolithic and Megalithic sites in Kerala. The important Palaeolithic sites are Valuvasseri (Nilambur) and Tenkara (Palaghat). The Mesolithic sites are Walayar (Palaghat), Mankara, Tenmalai (Kollam). Laterite rock-cut caves (Chenkallara), Hood stones (Kudakkallu), Hat stones (Toppikallu), Dolmenoid cists (Kalvrtham), Urn burials (Nannangadi) and Menhirs (Pulachikallu) are the monuments found in Megalithic sites. The studies point to the indigenous development of the ancient Kerala society and its culture beginning from the Paleolithic age, and its continuity through Mesolithic, Neolithic and Megalithic ages. Early inhabitants of Kerala belonged to the last phase of Middle Stone Age.The prehistoric people of Kerala belonged to the Negrito race and Proto Australoids. Chathanparambu near Farrokh is a famous prehistoric site in the Malabar region. The archaeological findings include dolmens of the Neolithic era, in the Marayur area. They are locally known as "muniyara", derived from muni (hermit or sage) and ara (dolmen). 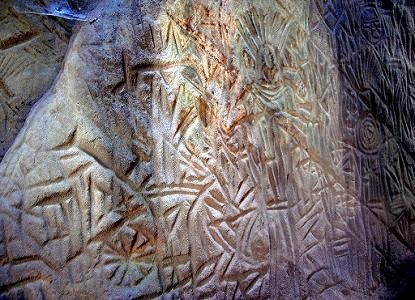 Rock engravings in the Edakkal Caves (shown in figure above) in the Ambukuthi hills of Wayanad are thought to date from the early to late Neolithic eras around 5000 BC. Writings in the Edakkal Caves belonged to the Dravida Brahmi script. BC 4000: It is considered that both Proto Australoid and Negrito race inhabited the land at that period. They used the Microlithic artifacts and it was founded near Calicut recently. Megalithic monuments including burial stones and urns were also found from the spot. Early inhabitants of Kerala belonged to the last phase of Middle Stone Age. BC 3000: Kerala also take part in Indus Valley Civilization that exists at that period. It is believed that Teakwood, Sandalwood and Ivory were exported to the western countries at that time. BC 2000: Trading of spices with Assyria and Babylonia. BC 1000: King Solomon exported ivory, spices, Peacocks, Monkeys from the Kerala to the west (Israel). BC 700: The migration of Dravidians from the Mediterranean area to South India is also said to be happened during this period. Ancient religion in Kerala was Dravidian in Nature. Later after centuries, different religions entered. BC 330: Megasthenes's reference of Kerala. BC 300: The Aryans migrated from north India to Kerala. Both Jain and Buddha religions entered Kerala. Jains transformed the major places at that time, Thrikkannamathilakom, Kallil, Ganapathi Vattam (Sulthan Bathery), Chitharal (Kanyakumari) into Jain Centers whereas sreemoolavasam is the major Buddha center at that time. BC 270 - 240: This period saw the spread of Buddhism in Kerala. A 3rd-century-BC (BC 257) rock inscription about Kerala (in the name of Keralaputra) is found in one of the rock edict by Emperor Asoka. BC 250 - AD 925: Ay Tamil Kingdom believed to be started their rule from early sangam period to 10th century. Their rule extended from Tiruvalla to Nagercoil. Their capital was at Aykudi, Podiyil Malai (Near to Shenkottai) and then they shifted it to Vizhinjam. The major Ay rulers during Sangam Period include Ay Antiran, Titiyan and Atigan. Post Sangam age, the rulers are Ay Sadayan (till AD 788), Karunandan (AD 788-857), Karunandadakkan (AD 857-885) who was the founder of famous Kandalur Salai and the Vikramaditya Varaguna (885-925). By the 10th century, Ays lost their territories to Cheras. BC 250 - AD 880: Mushika Kingdom (also called Ezhimalai Kingdom, Puzhinadu, or Mushaka Rajya) established in Sangam Age in the current northern part of Kerala. Disestablished in AD 880, after Chera Army invaded the Mooshaka kingdom. Retrieval of Pandyas. AD 45: A Roman-Greek sailor, Heppalus founded the direction of south west monsoon wind in AD 45. This finding helps him to find the route of Muziris (Kodungallur). They sail from the Horn of Africa to Kerala, India in 40 days. Thus they shifted the spice trade from north Indian ports to Muziris which called the "first commercial center of India." It enabled direct trade with Roman Empire. Many mariners like Panthenus, Cosmos Indicopleustes, Huan Tsang and others landed after this. AD 50 – 125: The Chera kings invaded several portions of northern Kerala. At this period, Kerala had very strong trade with the West. AD 52: St. Thomas, who was one of the twelve apostles of Jesus Christ, arrived in maliankara near kodungallur to spread the Christian missionary thoughts. He converted Hindus to Christianity in this year. He builds churches in seven places of kerala, kottakavu, palayoor, kokkothamangalam, niranam, nilakkal, kollam and thiruvamcode. AD 68: As a result of demolition of Jerusalem church by the Romans, the Jews migrated from Israel and some among them reached Kerala. They build their first church, synagogue in kodungallur. They settled in the locations of chavakkad, madayi, paravoor, mala, chendamangalam and mattancherry. After the formation of Israel in 1948, most of them returned to their native place. AD 74: Pliny, a Roman author and naturalist mentioned Kerala in his book, “The Natural History”. AD 125-180: Cheran Senguttuvan was one of the well-known rulers of this era. AD 216 - 428: According to Keralolpathy, the period up to AD 216 is called as ‘Parasurama’ period and the period starting from AD 216 to AD 428 is called as age of 'Perumals'. The Brahmin families are believed to be migrated during this period to Kerala and were settled in 64 villages. AD 345: In the leadership of Knai Thomman (Thomas of Cana), a group of Syrian Christians reached kerala. 400 christians from Baghdad and Jerusalem gotras reached kerala and from there onwards the number of Christians increased in kerala. AD 354: “Constantine the Great” in kerala. AD 550: Cosmas Indicopleustes, an Alexandrian merchant and traveler reached Kerala. This Byzantine monk had mentioned about the Christian group of Kerala in a book. AD 630 - Huan Tsang visits South India including Kerala. AD 644: Islam Scholar named, Malik Ibn Dinar from Persia reached Kerala to propagate Islam. He constructed mosques in the places of kodungallur, kollam, kasaragod, sree kandapuram, valapattanam, madayi, dharmadom, panthalayani kollam and chaliyam. AD 715 - 768: Rule of Cheraman Perumal. AD 788: Adi Shankaran (Shankaracharya) born in kaladi. He spread the advaitham in four parts of india by establishing four Madhoms in East Govardhana (Puri), South Sringeri (Mysore), West Dwaraka, and North Jyotirma?ha (Badarinath). Adi Shankara died in AD 820. AD 800 - 820: Kulasekara Azhwar who was the founder of Later Chera Dynasty in southern India and also was the first king of this dynasty who ruled from AD 800 to AD 820. AD 825: Kollavarsham Calendar started which is also known in the name of Quilon Calendar is the current Malayalam Calendar system. It was introduced in 25th July 825 AD. The Quilon city was recreated by Maruvan Sabareso. AD 851: The arrival of Persian Traveller, Sulaiman in Kerala. There onwards, Kollam is considered as the major harbor in South India. AD 869: Shankaranarayan (AD 825 - 900) wrote an astrology book called Shankaranarayaneeyam. It mentions about Grahana or eclipse and he also had run an Astrology centre at Mahodayapuram. He was the follower of Govindaswami. AD 945 – 955: Arab Traveller Al-Masudi visited Kerala. AD 974: The Mampalli Plate of Sri Vallabhan Kotha of Venad is considered as the first known record dated during the kollam era (149). It also becomes the earliest record in which the Panamkavil palace of the venad kings known. AD 988: Palya Shasanam of Vikramaditya Varaguna. AD 1000: Raja Raja Cholan attacked kerala and they destroyed Kandalur Salai. AD 1000: Bhaskara Varma- I had given the cheppadu to Jews at Mahodayapuram. According to that record, the jewish landlord, Joseph Ramban had got the rights including collecting taxes, to ride in a palankeen and 72 other rights. He also got the title of Anjuvannam. AD 1019: Rajendra Cholan attacked Kerala. AD 1044: Rajendra Cholan invaded Vizhinjam. AD 1070: Freedom from Cholas. AD 1090 – AD 1729: Venad Rule started in Southern Kerala. The last ruler of the Later Chera Kingdom, Rama Varma Kulashekhara, was the first ruler of an independent state of Quilon. The Venad era in Travancore lasts till the Aditya Varma period (1718 – 1721). The English East India Company occupied some land near Attingal (Anchuthengu) during the period of Umayamma Rani (who ruled the venad from 1677 to 1684). Later they extentended their company to the other parts of travancore city. At that time, a Mughal adventurer, Mughal Sardar obtained some suburbs from Umayamma Rani including Nedumangad . Later he was defeated by the Kerala Varma from Kottayam Royal Family and thus the Rani brought back her Trivandrum. During the late 17th century, the Ettarayogam members of the temples in Trivandrum are strong enough to challenge the decisions of Venad rulers. The clashes between both Aditya Varma and and the trustees of temple become common during that days. They poisoned the Aditya Varma and killed the six children of Umayamma Rani. This incident marks the beginning of end of Venad era. It happened with the fall of Rajah Rama Varma (1724-1729). AD 1100: Vembolinadu splits into two as Vadakkumkoor and Thekkumkoor. AD 1292: An Italian (Venice) named Marco Polo visited kollam and other places of kerala and recorded. AD 1295: Establishment of City Kozhikode. AD 1322: Friar Odoric of Pordenone visited India upon journey to China. He visited Malabar and then to Pandarani , which is about 20 miles north of Calicut, Cranganore, and also Quilon. AD 1324: Friar Jordanus from severic reached kollam for spreading missionary thoughts. He wrote the famous book, Mirabilia Descripta. He was the first foreign writer to mention about the Marumakkathayam system of Kerala. AD 1341: Muziris (100 BC – 1341 AD) located in Kodungallur was one of the greatest seaport in ancient eastern world. Upon the city was devastated by a flood from periyar or an earth quake in 1341, Kodugallur harbor got destroyed. From there onwards, Kochi became the major harbour of Kerala. AD 1342 – 1347: Ibn Battutam, an Ethiopian traveler visited Kozhikode. AD 1375 – 1475: Cherusseri Namboothiri, author of “Krishna Gatha” Period. AD 1405: Perumpadappu Swaroopam shifted from Thiruvanchikulam to Kochi. AD 1409: A Chinese Muslim voyager, Ma Huan visited Kerala. AD 1440: Nicholo Conti in Kerala. AD 1443: Abdur Razzaq, who was the ambassador of Shah Rukh, ruler of Persia to Calicut visited Kozhikode. AD 1466 - 1471: Pathinettara Kavikal. AD 1495 – 1575: Period of Thunjath Ramanujan Ezhuthachan, known as "the father of the Malayalam language. AD 1498: Vasco da Gama landed in Kappad at Kozhikode on 20 May 1498 and is welcomed by the Zamorin. Gama is the first European to found the marine route to India. He was sent to India by Portuguese king Dom Manuel. The Portuguese period in kerala started. AD 1499: Pedro Alvares Cabral reached Kozhikode following the path of Vasco da Gama. AD 1500: Cabral reached Kochi. AD 1502: The second visit of Vasco da Gama to Kerala. AD 1503: The inauguration of Portuguese Fort in Kochi. The other names of this Portuguese Fort are Pallipuram Fort, Ayakotta, Azhikotta and Vaippinkotta. Portuguese named this fort as Manual Fort. It is one of the old European constructions. AD 1505: Francisco de Almeida reached Kannur. He was the first Portuguese viceroy of India. AD 1509: Afonso de Albuquerque becomes the Portuguese viceroy. He is the first Governor of Portuguese India. AD 1510: War between the Portuguese and the Zamorin at Kozhikode. Portuguese attacked and defeat the Calicut's forces. AD 1513: Zamorins and Portuguese sign a treaty citing that Portuguese had right to build a fort at Calicut. AD 1514: The invasions of Cochin by Zamorins in Kodungallur. AD 1515: A treaty between Portuguese governor, Lopo Soares and Kollam Queen. AD 1524: The third visit of Vasco da Gama to Kerala. This time he came to kerala with the title of Portuguese Viceroy. He died in Kochi in the same year on the last day before Christmas. AD 1525: Portuguese navy force invaded Ponnani. AD 1531: Portuguese builded fort at Chaliyath. AD 1540: A treaty between Portuguese and Kozhikode in Ponnani. AD 1555: Portuguese builded a palace at Mattanchery in typical kerala style and gifted to kochi king, Veera Kerala Varma. Later this palace was rebuilded by Dutch and named it as Dutch Palace. AD 1564: The Portuguese fort at Kannur was attacked by Samoothiri. AD 1567: Jewish Synagogue established at Mattanchery. Today it was the oldest jewish church among Common Wealth Countries. AD 1571: Samoothiri invaded the chaliyam fort from Portuguese. AD 1579: Printing Press started at Vypinkara and Cochin by Jesuits. AD 1586: Melpathur Narayana Bhattathiri wrote Narayaneeyam. AD 1592: Establishment of Dutch East India Company. The Dutch were the first Protestant nation in Europe to establish trade contacts with Kerala. The Dutch period in kerala started. AD 1599: Udayamperoor Sunahadhos. (Synod of Diamper). AD 1600: Portuguese army killed Kunjali – 4. Kunjali Marakkar was the title given by Samoothiri to the Muslim naval chief. They are the first to attack the foreign army in India. AD 1604: A group of Ships of Dutch reached Kochi for the first time. Dutch were the first European protestant people to establish a trade relation with India. Portuguese belongs to Catholic Section. AD 1616: Captian Keeling reached Kerala and is the first British to come to Kerala. Captain Keeling arrived in Calicut with three ships which brought Sir Thomas Roe on his embassy to the court of Jahangir. From there onwards the growth of British power in kerala started. AD 1644: The English men (British) builded a trading place in Vizhinjam. AD 1645: Valmiki Ramayanam was translated to Malayalam for the first time by Kottayam Kerala varma. AD 1653: The Coonan Cross Oath (Koonan Kurishu Satyam) was a public avowal taken by the members of Saint Thomas Christian community of Kerala following the incident of Udayamperur Synod of 1599. As a result the community splits into two as Pazhaya Koottukar (Syro-Malabar Church) and Puthen Koottukar (Malankara Churches such as Orthodox, Jacobites, Mar Thoma, Malankara Catholics etc.). AD 1663: Dutch invaded Kochi from Portuguese and become the rulers of Kochi. AD 1677 - 1684: The first women ruler of Venad, Umayamma Rani Period. AD 1678: Hortus Malabaricus (Garden of Malabar) published from Amsterdam during 1678-1693, under the Governor of Dutch Kochi, Hendrik van Rheede, which deals with the medicinal properties of the plants in Kerala. It comprises of 12 volumes of book. It is the first book in which Malayalam script appears in print. AD 1684: Attingal Rani given the Permission to British to build a fort at Anjuthengu. AD 1694: The British builded factory at Thalassery. AD 1695: The construction of Anjuthengu Fort completed. AD 1696: Kerala Varma abolished several hateful customs known as Pulappedi, Mannapedi etc. in 1696. In the same year some landlords and the Ettara Yogam members assassinated him. AD 1699: A German born missionary worker, Arnos Pathri reached Kerala. AD 1701 - 1721: Rule of Rama Varma. AD 1708: The British East India Company built a fort in Thalassery in 1708, and is known as Tellicherry Fort. AD 1715 – 1717: War between Samoothiri and Dutch. AD 1721: Attingal Outbreak (Anjengo Revolt) is the first organized revolt against English. The revolt that happened in 1721 April 21st saw the massacre of 140 East India Company officers by native Indians. AD 1723: A treaty between Travancore and British. Marthanda Varma got title of "Prince of Neyyatinkara" in 1723. AD 1725: Mayyazhi becomes French colony. AD 1729: Emergence of modern Travancore. Anizham Thirunal Marthanda Varma became the ruler of Travancore with Padmanabhapuram as capital. He defeated several small kingdoms and merged with Travancore. So he is called as the founder of Travancore. AD 1731: Sree Padmanabha Swami Temple was rebuilt by Marthanda Varma. AD 1739: The Preparation of land records (Ozhuku) was first done by Mallan Sankaran upon instruction from Marthanda Varma. It consists of survey number, name and area of assets. The division of lands was done under the chief heads of Devaswom, Brahmaswom, Danam and Pandaravaka. Every landowner was given a patta stating the tax charged on each piece of land. AD 1741: Marthanda Varma defeated Dutch in Colachel War. It was first time that a European force defeated against a king in Asian continent. Marthanda Varma joined the best militants from Dutch in his troop and had rearranged his army in European model. He also appointed Dutch Commander Delanoy as the captain in his highness service. AD 1742: Marthanda Varma merged Ilayidathu Swaroopam (Kottarakara) with Travancore. AD 1744: Bolgatty Palace built by Dutch in Bolgatty Island in kochi. AD 1746: Marthanda Varma invaded Kayamkulam. AD 1749: Marthanda Varma merged thekkumkoor with Travancore. AD 1750: Thrippadi Danam of Marthanda Varma. He donated his entire kingdom to Lord Sree Padmanabha through Thrippadi Danam. Thus he got the name of Sree Padmanabha Dasan. In the same year, he invaded Vadakkumkoor. AD 1753: An agreement between Travancore and Dutch took place in Mavelikkara. AD 1755: The last Mamankam festival in Thirunavaya was held in 1755, and it is believed that it is ended with Hyder Ali’s Kerala Attack following the suicide of Saamoothiri. AD 1758: Dharma Raja Karthika Thirunal Ramavarma succeeded to the throne of Travancore following the death of Marthanda Varma in 1758. Upon attack of Tipu in Malabar region, Ramavarma gave shelter to the people fled from Malabar to South Kerala. Thus he got the name “Dharma Raja”. AD 1758: Hyder Ali attacked South Kerala. AD 1761: The Land Tax was first introduced in Kochi. AD 1766: Hyder Ali built a fort in Palakkad. AD 1772: Father Clement's Sankshepa Vedartham came out in 1772 and was published in Rome. It was the first Malayalam book that written in Malayalam font completely from first to last page. AD 1773: Hyder Ali defeats Samuthiri (Zamorins) at Kochi. AD 1779: British captured Mayyazhi (Mahe) and later it was given to French. AD 1788: Tipu Sultan attacks Kozhikode. Tipu Sulthan builded Faruqui city and he named it as the administrative capital of Malabar (Places under the rule of Tipu). AD 1789: Tipu Sultan attacked the Nedumkotta which is the north of Travancore. AD 1789: Raja Keshavadas become dewan of Travancore. He changed the title, from dalawa to dewan. He is also the first man to get the title “dewan”. He also got the title Rajah from British Governor Mornington, in pleasure of his talents. In return, he also added Dasan to his name to become Raja Keshavadas. He is the chief architect of Alappuzha Harbour Town and also taken steps to built Chala Market in Trivandrum. AD 1790: Sakthan Thampuran becomes the ruler of the Kingdom of Cochin. He was considered as the founder of modern kochi and the world famous Thrissur Pooram was first introduced by him. AD 1792: Srirangapatna Treaty was signed between Tipu and British. Upon that Treaty, the whole Malabar region under the control of Tipu was given to British. British appointed commissioners in the region to rule. AD 1793: Emergence of British Malabar. Calicut is the capital of British Malabar Region. AD 1793 – 1797: Kottayam Kerala Varma is the original Name of Pazhassi Raja. He attacked British by taking Puralimala as Centre. First Pazhassi Revolt in 1797. AD 1795: The fall of Dutch Kochi. AD 1795: Travancore accepted the British Supremacy. The British entered the administration of the state under the rule of Dharma Raja. AD 1798: Dharma Raja died in the age of 74, after a long reign of 40 years from 1758 to 1798. AD 1798: Avittom Thirunal Balarama Varma succeeded to the Throne of Travancore after the demise of Dharma Raja. AD 1799: Raja Keshavadas died. The name of popular place in Trivandrum, “Keshavadasapuram” was named after him. AD 1800: Colonel Macaulay became the resident for Travancore and Cochin under British East India Company from 1800 to 1810 and involved in the matter of an attack by Chempil Arayan. AD 1801: The administration of Malabar region is shifted from Bombay presidency to Madras presidency. AD 1802: Veluthampi Dalawa became Dalawa of Travancore. AD 1805: Shakthan Thampuran Died. AD 1805: Pazhassi murdered in November 30, 1805 following the revolt. The second Pazhassi revolt happened between AD 1800 and AD 1805. The Kurichiya group of Wayanad helped Pazhassi in the Revolt. Thomas Harvey Baber who was the sub collector at that time put an end to the revolt. AD 1807: London Mission in Kerala. AD 1809: Kundara Proclamation (January 11, 1809). AD 1809: Velu Thampi suicided by cutting his throat died in the Mannadi Temple of Pathanamthitta. AD 1809: Paliath Achan, the prime minister of Kingdom of Cochin and a strong supporter of Velu Thambi Dalawa was deported to Madras, where he was kept as prisoner. AD 1810: Gouri Lakshmi Bai succeeded to the throne of Travancore. AD 1810: Colonel John Munro becomes the resident of both Kochi & Travancore. He played an important role in administration of justice that take place in both Kochi & Travancore under the rule of Gouri Lakshmi Bai and Gouri Parvati Bai. He also takes step to start Secretariat administration in Travancore. AD 1812: Kurichiya revolt in Wayanad. The revolt occurred as a result of fixing Taxes by the British government on Scheduled Tribes of Kurichiyars and Kurumbers in 1812. They took arms to fight against British, but it ended unsuccessfully. Earlier Kurichiyars helped Pazhassi Raja for fighting against British and also gave shelter to him. AD 1812: Slave trade was abolished in Travancore by Rani Gauri Lekshmi Bhai. AD 1815: Rani Gouri Parvati Bai succeeded to the throne of Travancore. AD 1817: Primary education made compulsory by Rani Gouri Lakshmi Bhai. AD 1818: Rev. J. Dosan built an English School and a Dispensary at Mattancherry. AD 1821: CMS (Church Mission Society) press Built in Kottayam. They also built a school for Girls. AD 1829: Swathi Thirunal succeeded to the throne of Travancore. Maharani Lakshmi Bai was the mother of Swathi. He was declared as next ruler, much before Laksmi Bai got pregnant to give birth to Swathi. Thus he got the title of “Garbha Shriman''. AD 1830: Hazoor Kacheri shifted from Kollam to Kottakakam in Trivandrum. AD 1830: General Cullen discovers lignite deposits at the Seashore near Cannanore in Malabar. Later near Varkala near Trivandrum and also at Vaikom in Travancore. AD 1834: First English School built by Swathi Thirunal in Thiruvananthapuram. AD 1834: First Kaneshumari in Travancore. AD 1836: Star Bungalow in Thiruvananthapuram. AD 1845: First English Medium School in Ernakulam. AD 1846: Benjamin Bailey published his first English-Malayalam dictionary. AD 1846: Swathi Thirunal Died. His ruling period is called as the Golden Period of Travancore. AD 1847: A German born, Herman Gundert, Basel Mission worker published the first Malayalam newspaper, Rajyasamacharam in 1847 from Illikkunnu in Thalassery. In the same year he also published the newspaper Pashchimodayam. AD 1853: The slaves are released in Travancore. AD 1853: Chattampi Swamikal born in Kannamoola of Trivandrum. His original name was Kunjan Pillai. AD 1854: The slaves are released in Kochi. AD 1854: Malabar Special Police (MSP) organized. AD 1855: Birth of Sree Narayana Guru at Chempazhanthi. AD 1855: Malabar Collector, HV Konoli killed. The people belong to Mappila revolt killed him.Konoli Canal and a teak plantation “Konoli Plot” remains a memory of this Collector. AD 1858: Sir T Madhava Rao becomes the Dewan of Travancore. He is one among the best dewan of Travancore. It was during his period, the current Secretariat of Kerala was built. AD 1859: The first coir factory was established in Alappuzha in 1859 in the name of Daras Mail & Co by James Dara. AD 1860: The first college of Kerala, CMS is established in Kottayam. AD 1861: Ayilyam Thirunal Rama Varma succeded to the throne of Travancore. AD 1861: First Railway Line in Kerala, Beypore - Tirur in 1861 started. AD 1862: The Tellicherry Brennen School started in 1862 by the Basel Mission. Later it is changed to College. AD 1863: Ayyankali, the social reformer born in 1863 in Venganoor, Trivandrum. AD 1864: The first Government Hospital of Kerala established in Trivandrum (Thiruvanathapuram Civil Hospital - General Hospital) during the region of Ayilyam Thirunal. AD 1865: Pandara Pattam Proclamation. AD 1866: The English School built by Swathi Thirunal in 1834 changed into a University. That University is called as Today’s University College in Trivandrum. AD 1869: The inauguration of new Secretariat in Trivandrum. William Barton designed and built the new Secretariat, who was the chief engineer of Travancore. It was built based on Roman Architecture. Later it became the administration center of Thiru – Kochi and then for whole Kerala. AD 1872: Herman Gundert wrote the famous Malayalam English Dictionary. AD 1874: For the first time, Government Law College in Trivandrum established. AD 1877: The construction of main central road completed. The path extended from Trivandrum to Angamaly is now known in the name of State Highway Number 1. AD 1878: Swadeshabhimani Ramakrishna Pillai Born. AD 1880: Visakham Thirunal Rama Varma become the king of Travancore. The cultivation of tapioca cultivation started. AD 1883: Land Survey in Travancore Started. AD 1885: Sree Moolam Thirunal Maharaja succeeded to the throne of Travancore (1885 - 1924). AD 1887: The newspaper “Deepika” published for the first time in 1887 in Maanaath, Kottayam. Today it is the oldest Malayalam newspaper. AD 1887: Sri Narayana Guru founded Siva temple at Aruvippuram. AD 1887: First Novel in Malayalam Kundaletha by Appu Nedungadi was published. AD 1887: The Malabar Manual was published in 1887 by William Logan. AD 1888: Malayala Manorama Newspaper Company Started. AD 1888: The Travancore Legislative Council was established in the year 1888 with Dewan T. Rama Rao in the chair of meeting. AD 1888: In February 1888, Sree Narayana Guru installed a rock from the Neyyar River as Shivalinga at Aruvippuram. Brahmins argued it by citing the condition that only Brahmins can do that. In reply to this, Guru said that he installed an Ezhava Shiva. This incident is also termed as Aruvippuram Revolt. AD 1889: The first Novel “Indhulekha” written by O. Chandu Menon published. AD 1889: The First Ayurveda College of Kerala was started by Sree Moolam Thirunal in the name of Ayurvedic Patasala (Kashayappura). AD 1890: Sahodaran Ayyapan born. AD 1891: Malayali Memorial Agitation. According to that Agitation, a memorandum presented by a group of citizens under the leadership of GP Pillai and KP Shankara Menon to Maharaja Sree Moolam Thirunal on January 1, 1891. It was signed by more than 10,028 citizens which includes all castes and religions. It demands Sri Moolam Thirunal to secure government jobs for educated people in Travancore. At that time, most jobs were in the hands of Tamil Brahmins.It is the first recorded political movement in Travancore and Cochin. AD 1893: The death of Dr Herman Gundert. AD 1896: Ezhava Memorial under the leadership of Dr Palpu is a group memorandum signed by 13,176 Hindu Ezhava community members. It is also similar to Malayali Memorial which was submitted to King of Travancore demanding the Government to allow government jobs for educated people of Ezhava Community in Travancore. AD 1896: The Janmi Kudiyan Regulation Act in Travancore providing security of tenure to the tenants of private lands. AD 1899: Death of O. Chandhumenon. AD 1900: The visit of British Viceroy, Lord Curzon in Travancore and is also the first viceroy to visit Travancore. Curzon mentioned Alappuzha as “The Venice of East”. AD 1900: Due to the rejection of Ezhava Memorial by Travancore Government in 1896, they once again submitted the memorial to Lord Curzon in 1990. It is known in the name of “Ezhava Memorial in 1990”. AD 1901: K Ramakrishna Pillai, Started the magazine “Kerala Panchika” in Trivandrum. AD 1902: Rubber Cultivation started in Kerala for commercial purpose. The first Rubber Plantation was started in Tattekkadu ner Perumbavoor in Ernakulam. AD 1903: Sree Narayana Dharma Paripalana Yogam was registered in May 15, 1903 for the progression of Ezhava Community under the leadership of Sree Narayana Guru (President) and the secretary, Kumaran Aasan (upto 1919). The formation of SNDP Yogam led to the formation of Sadhujajna Pariplana Yogam, Pulaya Samudhaya Parishkarana Sabha, Valasevasamithi, Dheevara sabha,Yogashema sabha and the Nair Service Society. AD 1904: Sree Moolam Popular Assembly (Praja Sabha) started, the first legislative assembly among princely stated in India established in Travancore. AD 1904: First Railway in Travancore between Thirunelveli and Kollam. AD 1904: The bi-monthly magazine of SNDP, Vivekodayam started in Trivandrum with Kumaran Aasan as Editor. AD 1905: Vakkom Muhammed Abdul Khadir Moulavi started Swadeshabhimani Newspaper near Anjuthengu of Thiruvananathapuram District. Chirayinkeezhu CP Govinda Pillai is the first Editor of Swadeshabhimani. AD 1905: Ayyankali started a school to teach Dalit children at Venganoor. It is also the first school in kerala built for the welfare of children of Dalit people. AD 1906: K Ramakrishna Pillai becomes the editor of Swadeshabhimani. AD 1906: Raja Ravi Varma (1848 – 1906), great painter Died. AD 1907: Ayyankali founded the Sadhujana Paripalana Sangham in 1907, in Venganoor. In the same year Brahmananda Swami Sivayogi founded the Ananda Maha Sabha and C Krishna Pillai initiated the Samastha Kerala Nair Samajam. AD 1907: Kumaran Asan's famous poem, Veena Poovu was first published in the Mitavadi. AD 1908: Yogakshema Sabha started for the socio-cultural progression of the state. AD 1909: The first farmer group strike in kerala was first organized in Venganoor by Ayyankali. AD 1909: The old manuscripts containing 11 Bhasa plays written in Bhasa Sanskrit by T Ganapati Shastry was discovered from Manalikkara Matham in Munjira near Trivandrum. AD 1910: Swadeshabhimani K Ramakrishna Pillai was deported in September 26, 1910. Ramakrishna Pillai wrote the criticisms against P. Rajagopalachari, who was the then Diwan of Travancore and also Maharaja in Swadeshabhimani. This forced the authorities to taking away the newspaper and deported him from Travancore. AD 1911: Kerala Kaumudhi was founded in 1911. Under the leadership of CV Kunhiraman, Aloor S Padmanabha Panicker started Kerala Kaumudhi weekly. AD 1912: The Malayalam edition of life of Communist leader, Karl Marx was published for the first time in India by Swadeshabhimani K Ramakrishna Pillai. AD 1912: Sree Sarada Pradishta in Sivagiri by Sree Narayana Guru. AD 1913: Kodugallur Kunjikuttan Thampuran (1865 - 1913) Died. AD 1914: Under the leadership of Mannath Padmanabhan, the Nair Bhruthya Janasangham was formed in Mannath Bhavan of Perunna in Changanassery . First president was K Kelappan and Mannam is the first Secretary. It is later changed to Nair Service Society (NSS). AD 1914: Kerala Varma Valiya Koil Thampuran (1845–1914) died. He is also known in the name of Kerala Kalidasan. AD 1914: Sree Narayana Guru built Advaita Ashramam at Aluva. AD 1915: Ooruttambalam Revolt (Nineteenth Century Revolt) under the leadership of Ayyankali. In the same year, Kallumala Agitation occurred under the leadership of Ayyankali in Perinad of Kollam. AD 1915: Vagbhatananda Gurudevan (1885 - 1939) born in a backward caste founded “Atma Vidhya Sangam “. He fought against the Caste-Religion System, idol worship and also against alchol Consumption. AD 1916: Swadeshabhimani K Ramakrishna Pillai died. He was deported from Travancore in 1910 and after that he lives along with his wife in Madras, Palakkad and then settled in Kannur during his last days. He wrote Vrithantha Pathra Pravarthanam in 1912, which is known as the first book on journalism in Malayalam language. AD 1917: Sahodara Sangham established by K Ayyappan. Sahodaran Magazine was established under the editorship of K Ayyappan in Cherai, Vypin of Kochi. AD 1918: Under the leadership of CP Achutha Menon and TR Ramachandra Iyyer, Cochin Rajya Prajamandalam started. It was also during this year, the first bank of princely state, Cochin started in Thrissur. AD 1918: CV Ramanpillai wrote his first edition of the novel “Ramaraja Bahadur” in 1918. He published its second edition in 1919. His First novel is “Marthanda Varma” and his second novel is Dharma Raja. AD 1919: Sir Robert Bristow started the construction of Wellington Island in Kochi. The construction is mainly for increasing the depth and development of Kochi Harbor. AD 1919: Sambavar Sangam formed in Travancore. AD 1920: Gandhi visited Kerala for the first time as a part of Khilafat Movement. He came along with Indian Muslim nationalist, Shoukath Ali in Kozhikode. AD 1920: Sree Narayana Guru spread the message as a part of birthday wish “Liquor is poison, make it not, sell it not, and drink it not”. AD 1920: Congress committees of three regions, Travancore, Kochi and Malabar merged and formed the Kerala Pradesh Congress Committee (KPCC). T Madhavan Nair is the first secretary of the committee. AD 1921: The first All Kerala Congress Political Conference held at Ottappalam in April 1921 was conducted under the leadership of Andhra Kesari T Prakasam. AD 1921: Upon Khilafat Movement, the local Muslims of Malabar grouped and thus they got the strength. This irked the British rulers and they tried to put an end to this which resulted in Malabar Rebellion. AD 1921: The Wagon tragedy resulted in the death of 64 prisoners on 10th November 1921. The prisoners had been taken into custody as a result of Mappila Rebellion by the British. The ninety of the Muslim freedom fighters were arrested and dispatched by train from Tirur to Bellary Prison. When the wagon opened in Podanur station, 64 of them suffocated to death. AD 1921: Wagon tragedy (November 10). AD 1922: CV Raman Pillai died in March 21, 1922. AD 1922: First Trade Union in Kerala, the Travancore Labor Association was formed. AD 1922: Rabindranath Tagore visited Sree Narayana Guru in Sivagiri. AD 1923: Mathrubhumi, a tri weekly news paper in the days of Tuesday, Thursday and Saturday was founded by KP Kesava Menon in 1923 March 18th. Mathrubhumi becomes daily news paper in 1930 April 6. K Madhavan Nair was the first Manager of the news paper. AD 1923: Vakkom Moulavi founded Kerala Muslim Aikya sangham. AD 1924: Vaikkom Sathyagraham (March 30). AD 1924: Samadhi of Chattambi Swamikal. AD 1924: Kumaran Asan died at the age of 51 in boat accident in Alappuzha in January 1924. He is only Poet who got the title of Mahakavi without writing a Mahakavyam. AD 1925: Mahatma Gandhi visited Kerala for the second time in March 8, 1924 in order to find a solution for Vaikom Satyagraha. He also visited Sree Narayana Guru in Sivagiri. AD 1925: Based on Nair regulation in 1925, 'Makkathayam' was introduced. AD 1925: Cochin legislative Council was inaugurated in April 1925. Thottakkattu Madhaviamma (wife of Mannathu Padmanabha Pillai) was the first woman to be a member of any legislature Council in India. AD 1926: In 1926, Sethu Lakshmi Bayi passed the Newspaper Regulation to control the abuse of press with the introduction of license for them. AD 1927: Third visit of Mahatma Gandhi in Kerala. Under the presidency of Gandhi, a Harijan Meeting was held at Kozhikode. As a result, Kerala Andhiyajanodharana Sangam was formed and C Krishnan becomes its president and Kelapan became its secretary. It later worked in the name of Keralodharana Sangham. AD 1927: Samastha Kerala Sahitya Parishath was started in April 26th. AD 1928: Sree Narayana Dharma Sangam was registered in January 9th. Sri Narayana Guru samadhi at Sivagiri was also in the same year (September 20). AD 1928: Under the presidency of Jawaharlal Nehru, Nattu Rajya Praja Sammelanam was held at held at Ernakulam, passed the Aikya Kerala Movement. AD 1929: Under the presidency of Sir M Vishweshwaraya, Nattu Rajya Praja Sammelanam was held at Thiruvananthapuram. AD 1929: The first film production company of Kerala, Kerala Cinetown started by Ramavarma Appan Thampuran. AD 1930: Kerala Kalamandalam established near the bank of River Bharatapuzha in Cheruthurutti by king of Kochi. It was shifted to Vallathol Nagar in 1973. AD 1930: Salt Satyagraha of the nation also created waves in Kerala. Under the leadership of K Kelappan, Salt Satyagraha March started from Kozhikode and ended in Payyanur. Salt was made by violating the Salt Law. AD 1930: Kerala Kalamandalam was established. It was first built as an arts school in Kunnakulam Kovilakam for the purpose of performing Kathakali under the leadership of Mahakavi Vallathol Naryanan Menon. In 1938, the king of Kochi allotted land for Kerala Kalamandalam in the village of Cheruthuruthy in Thrissur District on the banks of the Bharathapuzha River. AD 1930: First silent film in Malayalam, Vigathakumaran (The Lost Child) released in 23rd October 1930 by the studio, Travancore National Pictures in Pattom. The film is directed by J. C. Daniel. JC Daniel and PK Rosy are the actor and actresses. AD 1930: P Subramoniyam started the first Movie Theatre “New Theatre” in Thiruvananthapuram. AD 1931: VT Bhattathiripad performed Yachana Yatra (Begger Travel) to collect money from Thrissur to Chandragirippuzha in Kasargod. The aim of this seven day Walk travel is to give the money to poor children for study. AD 1931: Guruvayoor Sathyagraha headed by K.Kelappan. AD 1932: Nivarthana Agitation in Travancore. AD 1933: United Muslim Association becomes State Muslim Association. AD 1933: Sree Chithira Thirunal Balarama Varma becomes the first Maharaja of Travancore to travel in Sea. AD 1933: The second Malayalam silent film, “Marthanda Varma” directed by PV Rao based on novel by CV Raman Pillai released. AD 1934: Mahatma Gandhi’s fourth Kerala travel and the purpose of this travel to collect fund for Harijans. AD 1934: Split in Congress. Rise of the Leftists and Rightists. AD 1935: The first Aeroplane service was started in kerala from Mumbai to Trivandrum. AD 1935: Communist party formed in Malabar by Sri EMS Namboothirippadu and Sri P Krishna Pillai. AD 1936: AK Gopalan with his 32 followers led the hunger march (Pattini Jatha) from kannur to Madras in July 1936. The main purpose of this march is to find solution for problems of Agricultural Employees, Unemployment, Hunger and Poverty. AD 1936: Sir CP Ramaswami Iyer becomes the Dewan of Travancore. AD 1936: Temple Entry Proclamation by Sree Chithira Thirunal Balarama Varma on the advice of Sir CP Ramaswami Iyer (November 12), allowing the lower castes (untouchables) to enter temple. AD 1936: Electricity agitation in Cochin State. AD 1937: Travancore University was founded. AD 1937: The fifth and final visit of Gandhi in Kerala. AD 1938: Communism in Kerala Started. AD 1938: The first talkie film in Malayalam, Balan Released. Directed by S. Nottani. AD 1939: Uttaravada Rule in Travancore started. AD 1939: Rajadhani March in October 23rd under the leadership of Akkamma Cheriyan. AD 1940: Morazha Incident took place in Kannur. AD 1940: The first hydro electric project in Kerala was started at Pallivasal. AD 1941: Under the leadership of VR Krishnan Ezhuthachan, Congress members of Kochi formed the Cochin Rajya Prajamandalam. AD 1941: Kayyur Struggle – The Kayyur Riot against caste system and imperialism was on 28 March 1941 in Kasargod. A policeman is killed related to the incident. The four accused persons were killed by Hanging in 29th March 1943. AD 1942: The Communist Newspaper, Deshabhimani started. It becomes daily in 1946. AD 1943: The first Radio Station started in Thiruvananthapuram. AD 1944: The first novel of Vaikom Muhammad Basheer, Balyakalasakhi published. AD 1945: National Book Stall started at Kottayam. AD 1945: Sahitya Pravarthaka Sahakarana Sangham started in Kottayam. The president of Sangham is MP Paul and its secretary is Karoor Neelakanda Pillai. “Thakazhiyude Kathakal” is the first story published by SPDS. AD 1946: Diwan, CP Ramaswamy introduced "American model” administration in Travancore in January 16. AD 1946: Punnapra-Vayalar Revolt. As a result, about 200 people shot dead in October 27. AD 1947: In a press meet held in June 11, CP Ramaswami Iyer issued a statement citing that Travancore would become independent following the Indian independence in August 15th. This statement led to controversy. A general meeting was held by the public in pettah in July 13th and police fired the public. A student named, Rajendran and 3 others were shot dead. After that Ramaswami Iyer resigned in 1947 following an unsuccessful murder attempt against him in July 25th. AD 1947: Diwan rule in Kochi also came to an end. AD 1948: First General Election in Travancore. The first ministry in Travancore; Pattom Thanu Pillai as Chief Minister with TM Varghese and C Kesavan as Sub Ministers. AD 1948: The first Film Studio of Malayalam, Udhaya started in Alappuzha. AD 1949: Thiru - Kochi came into existence in July 1, by merging both Travancore and Kochi. Travancore King, Sree Chitra Thirunal became the head of the states (Raja Pramukhan). Parur TK Narayana Pillai became the first chief minister and TM Varghese became the speaker of the newly formed Travancore-Cochin state. AK John, Dr EK Madhavan and TE Abdhulla became the ministers of Travancore whereas Ikkanda Warrior, K Ayyappan and Panampilly Govinda Menon became the ministers of Kochi. AD 1951: C Kesavan became the prime minister of Thiru-Kochi in February 28. AD 1951: The first super hit film “Jeevitha Nouka” released. The script and story was written by Muthukulam Raghavan Pillai and directed by Vembu. Thikkurishi Sukumaran Nair and BS Sarojam were the main actors of the Movie. AD 1951: Kerala Peoples Art Club (KPAC) based on Kayamkulam founded. AD 1952: AJ John became the first elected chief minister of Thiru Kochi. Consequent to the General Election of December 1951. AD 1953: Resignation of AJ John Government. AD 1954: The film that received the Silver Medal of President “Neelakuyil” released. AD 1954: Pattom Thanu Pillai won the General election from PSP Party supported by the congress, and became the chief minister of Travancore- Cochin. AD 1954: Mayyazhi (Mahe) formerly a French colony got independence. Mahi was then united with Indian Union. AD 1954: IK Kumaran Master who represented Mayyazhi Mahajana Sabha is also known in the name of Mayyazhi Gandhi. AD 1955: Pattom Thanu Pillai resigned and Panampilly Govinda Menon became Chief Minister. AD 1955: President Rule for the first time in Kerala, with Shri PS Rao was appointed as Advisor to Rajapramukh. AD 1956: The Novel Chemmeen of Thakazhi Sivasankara Pillai was published by Sahitya Pravarthaka Sahakarana Sangham. The novel got Kendra Sahitya Academy award in 1957. The novel was also made into a Movie by director Ramu Kariat in 1964 and released in the name of Chemmeen. In 1965, the movie got Golden Medal from the President of India. AD 1956: Kerala Sahitya Academy was formed with the aim of progression of Malayalam language and literature. Sardar Kavalam Madhava Panikkar was the first president whereas Vallathol Narayana Menon is the vice president. AD 1956: Malayalees long time wish happened with the merge of Malabar and Thiru-Kochi to form the Kerala State in November 1st 1956. AD 1956: Kerala High Court established in November 1. AD 1956: B Ramakrishna Rao became the first Governor of Kerala in November 20. AD 1956: Thomas Mundassery started Current Books in Thrissur. AD 1957: Palakkad, Kozhikode and Thrissur districts formed. AD 1957: First General Election. LDF (Communist) got lead in the February – March General Election. Kerala Legislative Council with 126 elected members came into existence. EMS became the first chief minister of Kerala in April 5. It was also for the first time, communist came to power in a state in India. Under this LDF government, there are 11 ministers including 3 independent ministers. AD 1957: Kerala Cabinet introduced Kudiyozhippikkal Ordinance. (April 11). AD 1957: Alappuzha District came to existence. (August 17). AD 1957: Niyamasabha passed the ordinance of Education bill in September 2 presented by Education Minister, Joseph Mundassery. AD 1957: Medical College in Kozhikode (October 1). AD 1957: Travancore University is re-named to Kerala University. AD 1957: Establishment of KSEB (October 31). AD 1958: Mahakavi Vallathil died (March 13). AD 1958: Ernakulam District came into existence. (April 1). AD 1958: Neyyar, Peechi Vazhani Wildlife Sanctuary centers came into existence. AD 1959: Colonel Goda Varma Raja introduced the second flying club of Kerala in January 7. He is considered as the father of sports Kerala. The birth date of GV Raja, October 13 is considered as the Kerala Sports Day. AD 1959: The Liberation Struggle (Vimochana Samaram) against the EMS led Communist Government. As a result, President rule started in the State for the second time. AD 1959: Kerala Karshaka Sangham founded. AD 1960: Kerala Panchayat Raj established and is inaugurated by Jawahar Lal Nehru in January 18. AD 1960: Sri. V.V. Giri appointed Governor of Kerala. AD 1960: Congress – PSP led Government came to power as a result of General Election in 1960. Pattom Thanu Pillai became the Chief Minister in February 22nd. Thus Thanu Pillai became the only chief minister who led Travancore, Thiru-Kochi and the Kerala Government and also the only chief minister in Kerala history, who born in the Nineteenth Century. AD 1960: Vardhakya Pension introduced. AD 1961: President accepted Kerala Karshika Boobhanda Bill in January 21. AD 1962: Kerala Panchayat Act came into existence in 1960. AD 1962: Guruvayoor Township established in January 26. AD 1962: Kerala Sastra Sahitya Parishad established in Kozhikode. First president was Dr K Bhaskaran Nair, Vice president was Konniyoor Narendranath, and Secretary is JK Adiyodi and the Khajanji NV.Krishna Warrior. AD 1962: Pattom Thanu Pillai resigned due to verbal argument against Congress Leaders. He is then appointed as Governor of Punjab. In the same year, R Sankar became the Chief Minister of Kerala in September 26. He is the first Congress chief minister of the state. AD 1962: Kozhikode Corporation came into existence (November 1). AD 1962: Kerala Lalitha Kala Academy founded in November 22. AD 1963: Thumba Rocket Launching Centre established in October. In November 21, the first rocket was launched weighing 715 kg with solid propellants; go up to a height of 208 km discharging sodium vapour that lit up the sky. AD 1963: Kizhanguvila Research Centre established in Trivandrum. AD 1963: Kerala Land Reforms Act passed by Niyamasabha in 1963. AD 1963: Indo Swiss Project in Mattupetty established. AD 1963: Sardar KM Panicker died in December 10. He is the first Indian ambassador in China. He called the Pazhassi Raja as “Kerala Simham”. He wrote “Parangipadayalli”. AD 1964: Cochin Port Trust came into existence. AD 1964: Home Minister of Kerala, PT Chacko resigned in February 20. He died in August 1. He was the first opposition leader of Kerala Legislative Assembly. AD 1964: PK Kunju presented Avishwasa Prameyam (No-confidence motion) in Niyamasabha. As a result, R Sankar had to resign and dismiss the Government when it was passed in the Assembly. No other parties took the cabinet; So Indian President took the rule of State for third time. AD 1964: Kerala Congress founded under the leadership of KM George. AD 1964: A split from the Communist Party of India in 1964 as CPI (M) and CPI. In Kerala, EMS became leader of CPI (M) and MN Govindan Nair became leader of CPI. AD 1965: A General Election was held in 4th March, but all the parties failed to form a cabinet. Thus the elections became abortive. Once again on March 25, President’s rule in the state for the fourth time. This happened only for one time in Kerala political history. AD 1965: KSRTC came into existence in April 1. AD 1965: The first film society of Kerala ‘Chitralekha’ started in Thiruvananthapuram in July. AD 1965: G Sankara Kurup got the first Jnanapeeta Award for ‘Odakkuzhal”. Odakkuzhal has 60 poems and was published in 1960. AD 1966: Indira Gandhi inaugurated the HMT unit in Kalamassery. AD 1966: Asan Smarakam built in Thonnakkal in July 24. AD 1966: President signed the Kerala Prevention of Eviction Act in 1966. AD 1966: Chemmeen released in 1965 got the national award for best film in 1966. AD 1966: Kerala Tourism Development Corporation (KTDC) established. AD 1967: As a result of General Election in February 20, 1967 EMS became the chief minister of the state in March 6. AD 1967: Kerala Government introduced Lottery Tickets and Chit Funds in June 15. AD 1967: The Sabarigiri Project located at Moozhiyar, Pathanamthitta under the control of Central Government. AD 1967: The first rocket built in India was launched in November from Thumba. AD 1967: Kerala Kala Peetam established. AD 1967: The number of Assembly seats increased from 126 to 133. AD 1968: The first Kerala lottery draws in January 26 and was introduced by the finance minister, PK Kunju. AD 1968: Thumba Rocket Launching Centre was taken by United Nations Organization (UNO) in February 2. AD 1968: Municipal Elections all over Kerala. AD 1968: Calicut University established in Kozhikode. AD 1968: Kerala Bhasha Institute in September 16 established in Nalanda Trivandrum. NV Krishna Warrior was the first Director. AD 1968: Sarada got the national award for best actress (Urvashi Award) for the film Thulabharam. AD 1968: G Shankarakurup founded the Odakuzhal Award. Vennikkulam Gopala Kurup got the first Odakuzhal Award for his work in Thulaseedasa Ramayanam. AD 1969: Government decided to give Education free up to Secondary Education for Students in January 6. AD 1969: Kerala Sahakarana Sangham law passed in May 15. AD 1969: Joseph Parecattil became the first Cardinal from Kerala who served as the Archbishop of Ernakulam from 1956 to 1984. AD 1969: Resignation of Kerala Chief Minister EMS in October 24. C. Achutha Menon became the Chief Minister in November 1. AD 1969: President accepted the Land Reform bill submitted by Kerala in December 16. AD 1970: Governor dismissed the Niyamasabha upon request from Chief Minister, C Achutha Menon in June 26. AD 1970: Upon fixing the date of General Election, the cabinet of Achutha Menon resigned in August 1. AD 1970: A Midterm Election was held in September 17. Achutha Menon once again became the chief Minister. AD 1970: Kerala Cashew Nut Development Corporation in December. AD 1970: Mannathu Padmanabhan, Panampilly Govinda Menon and Pattom Thanu Pillai died. AD 1971: Cochin University came into existence in January. AD 1971: Balasahitya Institute in Kerala in May 27. AD 1971: Actor Sathyan died in June 15. He is also the first winner of Kerala state award for best actor in 1969. AD 1971: K Kelappan, who popularly called as Kerala Gandhi died in October 6. He is the leader of Guruvayur Satyagraha in 1932 and also was the KPCC president during Indian Independence. AD 1971: Dr Vikram Sarabhai, who is called as the father of Indian Space Science died in Kovalam. AD 1972: Formation of Iddukki District in January 26th. AD 1972: The inauguration of Cochin Ship Building Yard in April 29. AD 1972: MN Govindan Nair introduced Laksham Veedu Colony in May 14. AD 1972: The Marxist Party’s strike for taking back the Micha Bhoomi. AD 1972: The name of Thumba Rocket Launching Centre changed to Vikram Sarabhai Space Centre (VSSC) upon instruction from Space Commission of India in July 10. AD 1972: The first hydro electric project of Malabar, Kuttiyadi Power Project established in August 11. AD 1972: Swayamvaram, directed by Adoor Gopalakrishnan got the national award for best film. AD 1973: Kerala won Santhosh Trophy Football for first time. AD 1973: Nirmalyam directed by MT Vasudevan Nair got the national award for best film (Gold Medal) from President. In this film, P J Antony (Character of Velichappadu) also got the national award of best actor (Bharat Award), who is the first keralite to get that award. AD 1973: Kerala Highway Research Institute established in Karyavattom, Trivandrum. AD 1974: The construction of tall Arch Dam in Idukki completed in May 24 under theco-operation of Canadian Government. The dam is constructed between the two mountains - Kuravanmala and Kurathimala and is the first dam in india of this type. AD 1974: Shipping Corporation of India established in Kochi in May 25. AD 1974: The former Union Defence Minister, VK Krishna Menon died in October 6. AD 1975: The Hindu Marriage Act and Joint Hindu Family System (Abolition) Act came into existence in 1975. AD 1975: The first sports school in Kerala, GV Raja Sports School established in Trivandrum in August 11. AD 1975: The introduction of Magna Carta of Kerala Act in October 2. AD 1975: Malayalam Poet and lyrics writer Vayalar Ramavarma died in October 27. AD 1975: Eravikulam became wildlife sanctuary. AD 1975: Kerala Forest Research Institute was established at Peechi in Thrissur. AD 1975: Kerala State Film Development Corporation established. AD 1976: Moolamattom Power Station in Idduki. AD 1976: Chitranjali Film Studio under KSFDC inaugurated in August 12. AD 1976: The inauguration of broad gauge railway track by Prime Minister Smt. Indira Gandhi between Thiruvananthapuram and Ernakulam in August 13. AD 1976: The Joint Family system of Kerala abolished though law. AD 1976: Idukki Wildlife Protection Centre came into existence. AD 1977: The number of Assembly seats in Kerala increased from 133 to 140. AD 1977: The famous painter, KPS Panicker died in January 15. He built the Artist village in Chennai Chola Mandalam. AD 1977: Election in both Lok Sabha and Legislative Council in March 19. K Karunakaran became the chief minister in March 25. But he resigned the post in April 25 due to adverse judgment in Rajan Case. It is also the least ruled Cabinet in Kerala History. AK Antony became chief of Kerala. AD 1977: AK Gopalan (AKG) died. He led the first opposition party in Lok Sakha of Kerala. He is known as the “Leader of Poor People”. AD 1977: Morarji Desai inaugurated the Navel Study Centre in Vizhinjam in September 24. AD 1977: Death of Joseph Mundassery in October 25. He is the first Education Minister of Kerala and also served in the position of literary critic, teacher and Novelist. Kozinga Elagal is his Biography. AD 1977: He is the first kerala women to receive the KC Elamma Arjuna Award. AD 1978: The Aeroplane Service from Trivandrum to Dubai in January 31. AD 1978: G Shankarakurup (February 12), P Kunjiraman Nair (May 27) and KP Kesava Menon (November 9) died. AD 1978: Upon resignation of Chief Minister AK Antony in October 26, CPI leader PK Vasudevan Nair became the Chief Minister in October 29. AD 1978: Eravikulam became the first place in Kerala to get the title ‘National Park’. AD 1978: Periyar Wildlife Sanctuary in Thekkady included in the Project Tiger Reserves. AD 1978: Cochin Stock Exchange and KSFE established. AD 1979: Pazhassi Dam in Kannur inaugurated in January 1. AD 1979: Film Director, Ramu Kariat died in February 10. AD 1979: Court finds the Karunakaran’s innocent in Rajan Case and presented the judgment in March 12. AD 1979: Inaugration of Thiruvananthapuram – Kanyakumari Railway line in April 16. AD 1979: PC Kuttikrishnan, also known as Uroob died. AD 1979: The ship “Kairali” of Kerala Shipping Corporation disappeared in the Arabian Sea in July 14. AD 1979: Inauguration of Trivandrum Railway Division in October 2. AD 1979: CH Muhammad Koya became the Chief Minister of Kerala in October 12, upon resignation of PKV in October 7. AD 1979: Kerala Land Reforms Bill was passed in Legislative Assembly in October 26. AD 1979: Upon the suggestion from Chief Minister CH Koya, Governor dismissed the Legislative Council in November 30. Kerala came under president rule for the fifth time in December 5. AD 1980: An election for the members to Kerala Legislative Assembly was held in January 21. EK Nayanar became the chief Minister of Kerala in January 25. AD 1980: The first ship “Rani Padmini” built in Cochin Ship Yard traveled in Sea in February 4. AD 1980: Milma founded in February 21st. AD 1980: Wayanad District came into existence in November 1st. AD 1980: Jnanpith Award for SK Pottekkatt for the novel “Oru Desathinte Katha”. It was for the first time, a malayalam novel got this award. AD 1981: President Rule in Kerala from October 21 upon resignation of EK Nayanar. AD 1981: Madras High Court released all acquits of Rajan Case in November 19. AD 1981: K Karunakaran became the Chief Minister in December 28. AD 1981: Punalur Liquor tragedy. AD 1982: Upon resignation of K Karunakaran, President Rule started in March 17. AD 1982: Legislative Assembly Election in May 19. K Karunakaran again becomes Chief Minister in May 24. AD 1982: Pants included in the uniform for local Police Men in March 18. AD 1982: SK Pottekkatt died in August 6. AD 1982: Television Telecast from Thiruvananthapuram in August 15. AD 1982: Massive Liquor Tragedy in August 15 in Vypin of Kochi, about 59 dead. AD 1982: Establishment of Pathanamthitta district in November 1. AD 1983: Death of CH Muhammad Koya in September 28. He is the first Muslim to become the chief minister in Kerala. Other positions he handled includes MLA, MP, Speaker, Minister and Home Minister. AD 1983: Gandhiji University came into existence with Athirampuzha in Kottayam as Center in October 26. Later in 1985 it is renamed as Mahatma Gandhi University. AD 1983: Kerala Niyamasabha passed the Azhimathi Viruddha Bill in December 15. AD 1983: Peppara Wildlife Sanctuary came into existence in December 21. AD 1984: Kasaragod came into existence in May 24 and it is the fourteenth and last formed district of Kerala. AD 1984: Chinnar Wildlife Sanctuary in Idukki came into existence in August 4. AD 1984: Shenduruny in Kollam and Chimmini in Thrissur are considered as Wildlife Sanctuaries in August 25. AD 1984: Kanyakumari – Jammu Himasagar Express started in October 2. It is the longest running train of India. AD 1984: Aralam became a wildlife sanctuary in October 15. AD 1984: Silent Valley became National Park. It is the second national park of Kerala. AD 1984: Thakazhi Sivasankara Pillai got Jnanpith award for the novel ‘Kayar’. It is second largest novel in malayalam after Vilasini’s Avakashikal. AD 1985: Malayalam Channel was telecasted from Thiruvananthapuram Doordarsha Kendra in January 1. AD 1985: Vailoppilli Sreedhara Menon died in December 22. AD 1986: Pope John Paul-2 visited Kerala. AD 1986: MV Raghavan out from CPI (M) in June23. He formed Communist Marxist Party, CMP in the same year. AD 1986: PT Usha won 4 gold medals and one silver medal in Asian Games. She became the golden star of the games and is also elected as the best athlete of Asia. AD 1986: Cochin University became Sastra Sanketika University in November. AD 1987: Lalithambika Antharjanam died in February 12. Her novel, Agni Sakshi got Vayalar Award. AD 1987: EK Nayanar became the chief minister of Kerala in March 26 upon the 8th general election held in March 23. AD 1988: The first flight landed in April 13 in Karipur Airport. AD 1988: Shaji N Karun directed Piravi. Piravi got the national awards of best film, director and actor (Premji). Only Swayamvaram (1972) got this much awards before Piravi. AD 1988: Perumon Train Tragedy in July 8. About 100 persons killed in the train accident at Peruman near Kollam. AD 1989: Prem Nazir in January 16 and Muttathu Varkey in May 28 died. AD 1989: In June 25, Kottayam became the first complete city to occupy complete literacy (100 %). AD 1989: Meera Sahib Fathima Beevi became the first women judge of Supreme Court in October 25, who earlier served as a Judge in Kerala High Court. AD 1989: NV Krishna Warrier, who served in the position of poet, newspaper editor and scholar died in October 12. AD 1989: Cartoonist Shankar died. He is considered as the father of Indian Politic Cartoons. AD 1990: Balakrishna Pillai lost his MLA post in Anti-Defection Act in January 15. He is the only person lost his MLA post by this law. AD 1990: Ernakulam District becomes the first complete literacy district in India in February 4. AD 1990: Kerala Sastra Sahitya Parishad got UN’s Global 500 award in June 4. AD 1990: Padma Ramachandran became the first women chief secretary of Kerala in October 31. AD 1990: Coconut (Nalikeram) is considered as an Oil Seed. AD 1991: Trivandrum Airport got the status of International Airport in January 2. AD 1991: The first election to the District Councils was held in 29th January 1991. LDF got the majority and they came to power in the District Councils. AD 1991: The first Techno Park in India was established in Kazhakuttom, Trivandrum in March 31. AD 1991: Upon Recommendation from Nayanar Government, Governor dismissed the Niyamasabha in April 5. A Legislative assembly was held in June 12. K Karunakaran became the chief minister in June 12. AD 1991: Kerala became the first state in India to attain complete literacy (100%) and it was recorded in April 18. This achievement was announced by Chelakkadan Ayisha in a program held in Kozhikode – Mananchira. AD 1991: Sree Chitra Thirunal Balarama Varma died in July 19. His final resting place is at Panchavadi. AD 1991: C Achutha Menon Died in August 16. AD 1991: Mahakavi Pala Narayanan Nair got the first Vallathol Award. AD 1992: Agasthyavanam Biological Park established in January 1. AD 1992: Kerala State Government gave the title Asthana Gayakan (Official Singer) to Yeshudas in April 3. AD 1992: KR Narayanan became the 9th vice president of India. AD 1992: Alappuzha – Kayamkulam Railway track built in November 20. AD 1992: Thoppil Bhasi died in December 5. AD 1992: KR Gouri Amma out from CPI (M) in December 9. She then started the Janathipathiya Samrakshana Samithi (JSS) party. AD 1992: Dalai Lama visited Kerala in December 26. AD 1992: TE Vasudevan got the first JC Daniel Award. AD 1993: Kerala defeated Maharashtra in Santhosh Trophy in March 2. AD 1993: 100% Literacy Rate for Adivasis in the state. It is recorded in July 4. AD 1993: Pension for Journalists was introduced for first time in India in August 1. AD 1993: The first private TV channel, Asianet started. AD 1993: Doordarshan started Malayalam channel through Doordarshan Metro (DD2). AD 1993: Sooranad Kunjan Pillai got the first Ezhuthachan Award in November 2. Ezhuthachan Award was the biggest award given by State Government for literature. AD 1993: Rajiv Gandhi Indore stadium in Kochi established in December 19. AD 1994: Hydroelectric Project in Kallada in January 5. AD 1994: Guruvayur – Thrissur Railwaypath introduced in January 9. AD 1994: Panchayat Raj Bill passed. District Councils came in April 24, 1991 eliminated. AD 1994: The first phase of DPEP came into existence in July. AD 1994: Vaikom Muhammad Basheer died in July 4. AD 1994: Koothuparamba Firing in November 25. AD 1994: The first finance commission formed. AD 1995: Inauguration of Diesel Power Plant in Nallalam, Kerala in January 12. AD 1995: K Karunakaran resigned in March 16 and AK Antony became the Chief Minister in March 22. AD 1995: PN Panicker died. He is known as the Father of Library Movement in Kerala. His death day in 19th June is observed as Vayanadinam (Day of Reading). AD 1995: 3 Tier Model of Panchayat Raj System introduced in October 2. AD 1995: Electricity generated from Wind Power System was introduced in Kanjikode, Palakkad in November 7. AD 1995: The ordinance of Malabar University to built in Kannur in November 16. AD 1995: Naivedyam of Balamani Amma got Saraswati Samman in December 11. She is the first malayalee to get that prize. AD 1995: Jnanpith Award for MT Vasudevan Nair. AD 1995: Folklore Academy based on Kannur. AD 1995: Kannur Medical College started. Kannur Medical College is the sixth Medical College in Kerala. AD 1996: Malabar University inaugurated in Kannur in March 2. The name later changed to Kannur University. AD 1996: Kerala Women's Commission founded in March 13 with Sugathakumari as its first President. AD 1996: Liquor Prohibition in Kerala introduced in April 1. AD 1996: LDF won in Legislative Assembly Election. EK Nayanar became chief minister in May 20. AD 1996: Kerala Sastra Sahithya Parishad (KSSP) won the Right Livelyhood Award. AD 1997: Brahmapuram Diesel Power Plant started in June 5. AD 1997: KR Narayanan became President of India in July 25. He is the First Malayalee and also a first Dalit to occupy this position. AD 1997: Sivagiri Rule was totally taken by Government in October 9. AD 1998: EMS (First Chief Minister of Kerala) died in March 19. AD 1998: Human Rights Commission formed in Kerala in December 11. AD 1999: Kayamkulam Thermal Power Plant inaugrated by Prime Minister, Shri Atal Behari Vajpayee on January 17, 1999 in January 17. AD 1999: Book Publisher, DC Kizhakemuri died in January 26. Thakazhi Sivasankara Pillai died in April 10. AD 1999: Kerala Lokayukta came into existence in April 30 and Human Rights Commission came into existence in May 6. AD 1999: The municipalities of Kollam and Thrissur become corporation in June 2. Thus kerala has 5 Corporations including Thiruvananthapuram, Kochi and Kozhikode. AD 1999: Kerala High Court verdict “Smoking in public Places is prohibited”. AD 1999: Prabhat Patnaik became chairman of second financial commission. AD 2000: Nedumbassery Airport in Ernakulam becomes International Airport in June 11. AD 2000: KK Usha became the first malayalee women to become the chief Justice of Kerala High Court. AD 2001: High Court Judge, D Sreedevi became the president of Kerala Women’s Commision. AD 2001: AK Antony became the chief minister of Kerala in May 17 following the election held in May 10. AD 2001: UNESCO honoured Koodiyattam (Dance form of Kerala) as a most valued art form of humanity. AD 2001: Government banned the use of Endo sulphan as it is injurious the health of people. AD 2001: For the first time in Kerala History, white paper published for State Finance in June 18. AD 2001: Kadalundi Train Accident in June 22. AD 2001: INFAM (Indian Farmers Movement) started in Kottayam under the presidency of Father Vadakkemuriyil. AD 2001: Mavoor Grasim Factory was closed due to Environmental Pollution. AD 2001: First Malayalam audio novel ‘Ithanente Peru’ written by Sakkariya published. AD 2001: Tinu Yohannan becomes the first Malayali to be selected to the Indian cricket team. AD 2001: Malayala Manorama Associate Editor,Thomas Jacob is selected the chairman of Press Academy. AD 2001: First AIDS patient in the state, Chithra (Kilimanoor) dies. AD 2002: Kumarakom Boat Tragedy in July 27. AD 2002: Jeevan TV becomes first Malayalam channel to telecast English news. AD 2002: Dr. Kamala Surayya is selected for the Ezhuthachan Award. AD 2003: Communal Riots in Maradu. AD 2003: Kerala’s first coast-Guard station is started at Vizhinjam. AD 2003: Vellanadu Panchayat in Trivandrum becomes the country’s first fully computerized Panchayat. AD 2003: Calicut based Nedungadi Bank merges itself with the Punjab National Bank. AD 2003: Global Investors Meet (GIM) in Cochin inaugurated by the Prime Minister as A.B.Vajpayee. AD 2004: Sikhandar Bhakt died in February 23. He is the first Kerala governor who died while in service. AD 2004: R.L. Bhatia becomes Kerala Governor. AD 2004: Anamudi Shola forest area in Idukki district becomes National Park. AD 2004: EX Chief Minister, EK Nayanar died in May 19. AD 2004: AK Antony Resigned. (August 29) Oomen Chandy became Chief Minister in August 31. AD 2004: Dr Jhansi James became the vice chancellor of MG University in November 8. She is the first women to become VC in Kerala. AD 2004: Tsunami in December 26 brings disaster to Kerala coastal villages. AD 2004: M.K. Ramachandran Nair sworn in as the Vice Chancellor of Kerala University. AD 2004: Former Chief Secretary K.B. Raveendran Nair becomes the Chairman of Third Finance Commission of Kerala. AD 2004: P.K.Muraleedharan becomes the first Indian to Control Olympic Boxing Competition. AD 2004: Kerala government decides to start Jalanidhi Project. AD 2005: Prime Minister, Dr. Manmohan Singh launched Vallarpadam Container Terminal with the laying of the foundation stone in February 15. AD 2005: Adoor Gopalakrishnan became the first malayalee to receive Dadasaheb Phalke Award. AD 2005: Popular Author and Cartoonist, OV Vijayan died in March 30. Ex Chief Minister, PK Vasudevan Nair died in July 12. Ex President of India, KR Narayanan died in November 9. AD 2005: Kerala Government bans online lottery. AD 2005: Palat Mohandas sworn in as the Chief information Commissioner. AD 2005: Kerala Legislature’s first woman Deputy Speaker K.O. Ayisha Beevi dies. AD 2005: Dr. Sripat Ganapat Bhat becomes the first V.C of the newly started National University of Advanced Legal Studies. AD 2005: Retired High Court Judge T.K. Chandrasekhara das is appointed the Ombudsman. AD 2005: Raman Sri Vastava is appointed as the D.G.P. with the charge of law and order. AD 2006: Saraswati Samman for Ayyappa Paniker. AD 2006: Kalamandalam becomes Deemed University for Art and Culture. AD 2006: LDF won in Kerala Assembly Election. VS Achuthanandan became the chief minister of Kerala. AD 2006: M Chandran, LDF constituent of Alathur (Palakkad) won the seat by the highest margin in the in history of Kerala State Elections — 47,671 votes. AD 2006: The rupee coin with the face of Sree Narayana Guru released. AD 2006: AK Antony becomes the defence minister of India. Previously VK Krishna Menon from Kerala also held this position. AD 2006: Justice V.K. Bali is appointed the Chief Justice of Kerala High Court. AD 2006: Famous literary critic and writer Prof. M.Krishnan Nair dies. AD 2006: P. Kamal Kutty is appointed the Chief Election Commissioner. AD 2006: Muttathu Varkey Award 2006 is given to Kamala Surayya. AD 2006: Dr. Samuel Paul is selected for this Year’s Jitgil Memorial Award instituted by theWorld Bank for Social Service. He is the First Asian to win the honour. AD 2006: K. Radhakrishnan sworn in as the speaker of 12 Kerala Legislative Assembly. AD 2006: Famous Economist Prabhat Patnaik is appointed as the Vice - Chairman of State Planning Board. AD 2006: Senior Advocate C.P. Sudhakara Prasad is appointed as the Advocate General. AD 2006: Justice N. Dinakar is appointed the state Human Rights Commission Chairman. AD 2006: Suma Varma is appointed the Banking Ombudsman of Kerala and Lakshadweep. AD 2006: The Vallathol Award for this year is given to O.N.V. Kurup. AD 2006: Adayalangal of Sethu wins the Vayalar Award for this year. AD 2006: This year’s Ezhuthachan Award for lifetime contribution to Malayalam language and literature is conferred upon Kovilan. AD 2007: In order the spread the importance of handlooms, chief minister inaugurated the program “Kerala Thanimakku Kaithari” in January 6. The aim of this program is that people should wear Handloom clothes at least once a week. AD 2007: Justice KG Balakrishnan became the 37th Chief Judge of Supreme Court in January 14. He is the first keralite to hold this position. AD 2007: Kerala PSC application through Online started in January 27 as a part of Silver Jubilee Celebration of Public Service Commission. AD 2007: Disaster Management Authority formed in Kerala in March 13. AD 2007: Japan-aided Drinking Water Project launched in March 27. AD 2007: Kerala Agriculture Debt Relief Commission commenced in April 8. AD 2007: Haritha Sree Project launched in April 22. AD 2007: State government given sanction to Tecom Company to built Smart City in Cochin in April 25. AD 2007: Janayugam daily republished in May 31. AD 2007: “Ente Maram” project established. AD 2007: Kerala government confirmed Vallamkali as a sport event. AD 2007: Abdul Nazer Madani released from Coimbatore jail after nine years in August 1. AD 2007: MOU signed between Kerala govt and Sobha Developers for building HighTech city in Cochin in August 20. AD 2007: Plastics with thickness less than 30 micron banned in Kerala in September 1. AD 2007: Public Works Department, PWD Minister TU Kuruvila resigned. AD 2007: The surrounding places of Silent Valley National Park with 148 square kilometers area were declared as buffer zone in September 23. AD 2007: Mons Joseph became Minister of Public Works Department in October 18. AD 2007: Decision to form Kerala Law Reforms Commission under Justice V.R. Krishna Iyer. AD 2007: VS Achuthanandan and Smart City Executive Director Sri Farid Abdul Rahman laid the stone for Smart City in November 16. AD 2007: The Kerala Hitech Industries Ltd (Keltec) controlled by Government had given it to BRAHMOS Aerospace in December 3. AD 2008: Kannur Airport becomes International Airport in January 11. AD 2008: Kisan Sree Insurance Programme Started in March 26. AD 2008: Poet Kadammanitta Ramakrishnan passed away in March 31. AD 2008: National Rural Employment Guarantee Scheme Started in April 1. AD 2008: Plastic products with thickness lesser than 50 micron banned in Kerala in April 21. AD 2008: Ramakkalmedu Wind Energy Project established in April 27. AD 2008: Indian President, Pratibha Patil inaugurated Niyamasabha Golden Jubilee Valedictory function in April 30. AD 2008: K. Raghavan Nambiar became Vice Chairman in Sangeetha Nataka Academy. AD 2008: Decision on set up IT Parks at Alappuzha, Thrissur and Kannur in May 3`. Also decided to built country's first aqua park for ornamental fishes at Kadungalloor close to Aluva. AD 2008: Kerala Social security Mission launched. AD 2008: Canonization of St. Alphonsa held in Vatican in October 12. Gonsalo Garcia in 1862 was first Indian of Canonization. AD 2009: Kamala Surayya died in May 30.